Carrying off the Overall Winner trophy at the Supply Chain Excellence Awards requires an organisation to demonstrate all the characteristics and attributes of a world-leading supply chain; it must lead its sector through the creation of innovative strategies, display dedicated and inspirational leadership, encourage team engagement, and of course, prove exemplary execution of the strategy to the overall benefit and performance of the enterprise. But the Overall Winner must even go further than this. It must be able to prove that it is better than the winners of all the other industrial categories. From left to right: Stephen Brooks, managing director of Akabo Media, Rachel Passey, Supply Chain transformation Lead, Severn Trent, Fulya Hinde – DST team manager, Severn Trent, Jay Barnett-Evans, warehousing team leader, Shelton, Severn Trent, Phil Donnelly – supply chain analyst, Severn Trent, Ema Yasenova – project manager, Severn Trent, Tomas Molenda, Warehousing team leader, Severn Trent, Chris Wand, Head of Supply Chain, Severn Trent, Jason Fletcher, Supply Chain Integration Lead, Severn Trent, Colwyn Griffiths, Warehouse Operative, Severn Trent, Stuart Thomas, Warehousing manager, Severn Trent, and host Sara Pascoe. This year is no exception; the outright winner of the 2017 Awards demonstrates all the characteristics and attributes of a world-leading supply chain. But before revealing the winner, let’s look through the top contenders first. The process for determining the Overall Winner involves the assessment and comparison of each of the six Industry Sector winners. So shortlisted for the trophy were – Elval SA, Euro Car Parts, Lesara, McVities Carlisle – Pladis UK, Severn Trent Plc, and Turkcell İletişim Hizmetleri AŞ. The scores for Turkcell were high and the judges were really impressed by the telecommunication company’s vigour in taking on a major cost transformation programme aimed at making substantial cost savings on a billion euros a year global spend. The approach taken by the cross-functional project team to create a less-fragmented, re-designed procurement structure, supported by local subcontractors as well as global vendors, offered considerable savings and benefits to the business. The judges also liked the streamlined tendering process, involving a new negotiation strategy and a partner selection process, which greatly helped to enhance value. There was plenty for the judges to like and appreciate in Turkcell’s entry, especially around the way the teams involved tackled the complex issues surrounding the hi-tech installation projects. This was an entry that deserved the praises of the judges – but did it have the scope and scale they were looking for in an Overall Winner? Then there was the entry from McVities Carlisle – Pladis UK. This was another very strong contender for the world’s most prestigious supply chain trophy. The biscuit maker stunned the judges with its startling performance in rebounding from a natural disaster, when in December 2015 its Carlisle factory was flooded during Storm Desmond. The production facilities were recovered in just four months and full production levels were regained within five months of the storm. What’s more, the site achieved recognition of its high service levels from April to December 2016 by attaining BRC Accreditation A+, as well as taking second place in the Advantage Group Survey of all the major UK retailers. Not bad for an organisation that had been hit by disaster just a year earlier. But the Pladis entry went far beyond this. They outlined their unique collaborative partnership with KP Intersnacks, whereby Pladis operate as a third party logistics provider for KP Snacks, managing the distribution of over 200 million cases per annum. They also impressed the judges with their excellent approach to customer service – expanding and up-skilling the customer and collaboration team to manage all UK export for Pladis and KP. The business was set on a journey of continuous improvement and the judges liked what they saw. Pladis were certainly excellent, however, there was one entry that went even further. Severn Trent Plc took the judges’ breath away with what they managed to achieve in just one year – a complete supply chain transformation using innovative techniques and well-placed technology. The sheer scale and scope of the project, along with the meticulous way the transformation was planned and executed – within such as short space of time – deeply impressed the judges. This was supply chain management at its best. Severn Trent water is a FTSE 100 Company delivering critical services to over 4.5 million households and businesses – operating over 46,000 km of water pipes and 91,000 km of sewers. After a major review of the company’s supply chain it was realised that a major restructuring was required. The judges admired the approach taken by the team to benchmark both inside and outside the sector, the extensive modelling undertaken and the full data analysis engaged in to create an exemplary supply chain operating model. The speed with which change was effected was staggering – the building of three new RDCs in under six months, the creation of a new internal distribution network to 65 key sites, the introduction of self-serve stores using vending machines, the implementation of bar coding at distribution centres and self-serve stores, the streamlining of van stock across 1,500 vehicles, to list just some of the individual projects. The benefits to the business have been just as dramatic – a reduction of lead times for operational teams on critical parts by 75 per cent, improved asset availability, enhanced visibility and efficiency gains in managing inventory, a standardisation of the workstream which has driven a reduction of 70 per cent in unique items purchased, a 20 per cent cost efficiency from base spend, greater stock pick accuracy, consolidated invoicing, a reduction in obsolescence, faster access to materials for frontline teams, and standardisation on spare parts has resulted in cost savings of up to 75 per cent. What’s more, the entire programme was delivered internally. These were stunning results and the judges could not have been more impressed. The judges said, “This was a project that inspires – they have transformed a fragmented supply chain and have created a structure that delivers competitive advantage through enhanced visibility, transparency, and performance. 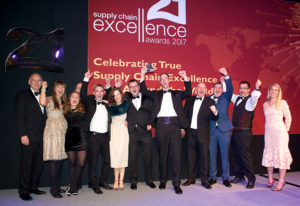 This is supply chain excellence in abundance.” The Overall Winner trophy for 2017 was deservedly awarded to Severn Trent Plc.